Steward unsuccessful in attempt to pull him back. 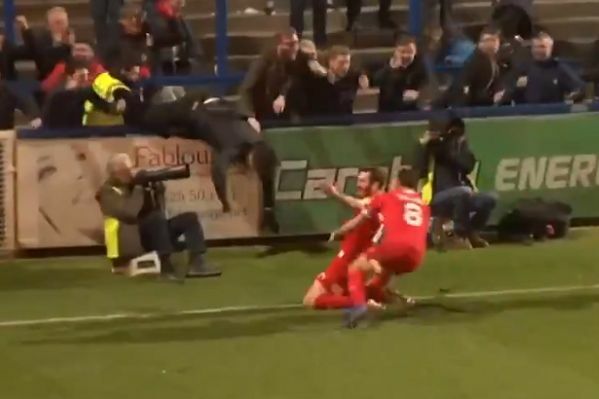 A Swindon fan fell headfirst over an advertising hoarding trying to join in with the team celebrating Jak McCourt’s late winner at Macclesfield. The midfielder’s 92nd minute goal sparked scenes of jubilation among the travelling Robins faithful, some of whom rushed to the front to embrace their players. One such supporter took a tumble over the barrier, despite the efforts of a steward attempting to tug him back into the stand. Two more stewards arrive swiftly on the scene to bundle him back over the divide and away from the pitch at Moss Rose. Tyrone Marsh had put the home side ahead, with Marc Richards equalising before the half-time break. McCourt would later strike in stoppage time to seal Swindon’s first ever win at Macclesfield and consolidate their mid-table position in League 2. Sol Campbell’s Silkmen on the other hand lie second from bottom, three points ahead of their manager’s former side Notts County.